No, not THAT Riveria. The Mayan Riviera in the Yucatan Peninsula, just south of Cancun in Mexico, abutting the Caribbean Sea. 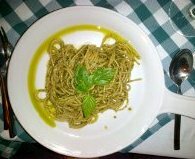 Fresh Spaghetti with Freshly made Pesto! 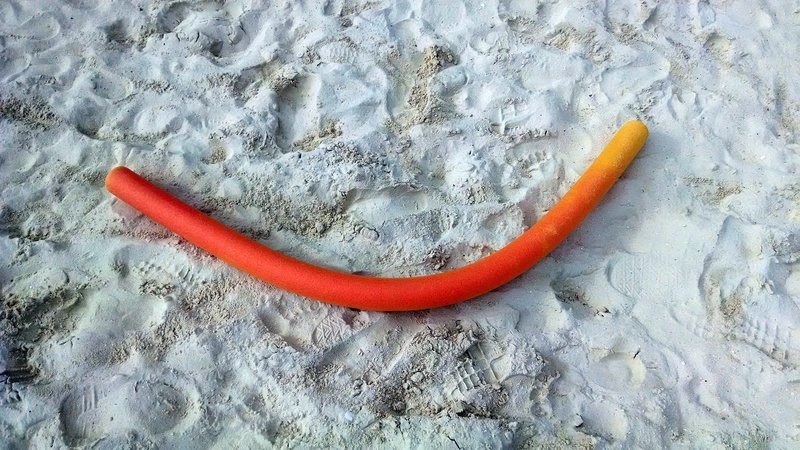 The scene is Playa del Carmen, a somewhat low key, almost European, seaside town only recently rising (or falling?) to major developers and high end merchandise sellers. Rhinestone sombreros are morphing into Swarovski Crystals. The dinners, by myMEGusta’s and her travel companions’ choice, are Italian. 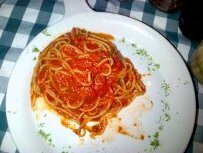 Delicious, perfect pasta, tasting just as it does in Italy: Cooked to an al dente turn and lightly dressed in elemental sauces, for example a delicious arrabiata made only of lush San Marzano tomatoes, garlic, and chili oil, in a portion reasonable for a normal person to finish. 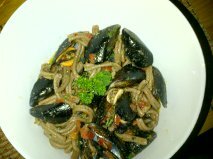 Another recent standout, a bit more modern and pan-Mediterranean, was homemade whole wheat strozzapreti (similar to cavatelli, and meaning “priest-strangler” in Italian – myMEGusta reports the facts, we do not make these things up) with tomatoes, mussels, olive oil and a fish roe seasoning the chef called liseta (in lieu of the sea urchin on the menu and out of stock). Then, there are the pizzas: Paper thin crusts, just like in Naples, with the thinnest layers of accoutrements. 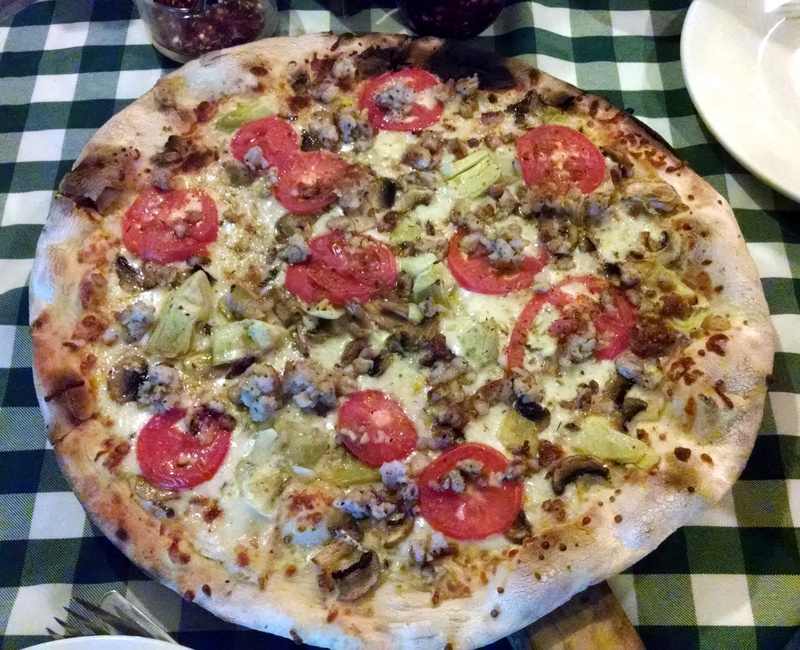 Take the Pizza Luna: Tomatoes, artichokes, mushrooms, a little mozzerella and a little Italian Sausage on a micro thin crust. So, how can this be, when a Mexican resort town produces Italian food of consistently authentic quality and it is impossible to get REAL Italian food in most of the United States, supposedly a sophisticated food mecca? It has to do with unfettered history. Combine this trend with the large number of European, particularly Italian, and other international visitors to Playa, there was a perfect storm of sustaining the quality of these restaurants, rather than their being diluted to suit local tastes or American tourism. And it lives on today. Perhaps another factor is that the indigenous foods of the Mayan Riviera are fresh and boldly flavored, so the “locals” never forced the Italian dishes to become homogenized and bland. Walking along Fifth Avenue, there are innumerable Italian restaurants, not all as good as the best, but many “trained” in the art of handmade pasta, some even visible from the street, but, of course, not including the 130 peso all-you-can-eat joints. You can even go to a beach restaurant and get incredible spaghetti and a more authentic pizza than in most cities in the United States.